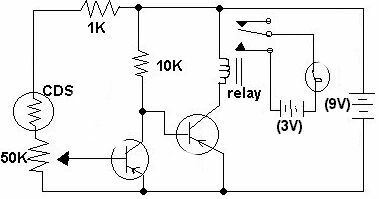 This circuit for an electronic night light was submitted by Adam from Canada. I have provided the notes. The two transistors are used as a direct coupled switch, Adam used 2SC711 but any general purpose transistor will do e.g. 2N3904, BC109C. The CDS photocell, type ORP12 is normally illuminated, therefore its resistance is low. The 50k control, the 1k resistor and the photocell form a potential divider which biases the first transistor. This transistor is on, its collector being held low, turns the last transistor and hence lamp and relay off. In darkness, the resistance of the photocell becomes high and the first transistor switches off. The base voltage for the second transistor goes high, switching this transistor on and illuminating the lamp. Although Adam used a secondary supply of 3V , you could use any voltage and any lamp here. Make sure the relay contacts can handle the load. If using a large relay, it is preferable to wire a 1N4001 in reverse polarity across the coil. This will prevent the back EMF of the relay from damaging the transistors.